Metallic silhouette shooting is a group of target shooting disciplines that involves shooting at metal cutouts representing game animals at varying distances. Metallic silhouette shooting can be done with airguns, black powder firearms, modern handguns, or modern rifles. 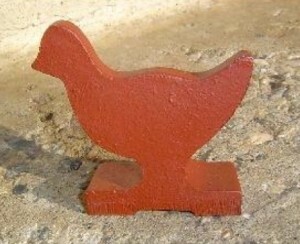 The targets used are rams, turkeys, pigs, and chickens, which are cut to different scales and set at certain distances from the shooter depending on the specific discipline. Metallic silhouette is descended from an old Mexican sport, dating back to the early 1900s, where live game animals were staked out at varying distances as targets. By 1948, metal cutouts of the animals were used instead of live animals, and the first metallic silhouette match was held in Mexico City. Because of its Mexican roots, in America the silhouettes are often referred to by their Spanish names, Gallina (chicken), Javelina (pig), Guajalote (turkey), and Borrego (ram). While there is no limitation on the magnification allowed in scopes, shooters now tend to use a scope that is twenty power or higher, although many still use a lower power. While 6mm is the smallest caliber allowed in High Power competition, it is well known that a 6mm bullet will not knock the sheep target off its stand reliably. For that reason, most silhouette shooters use larger calibers. The most popular ones seem to be variations of 6.5mm and 7mm (6.5x47mm Lapua and 7mm-08). Since Smallbore Rifle silhouette is simply a miniature of the High Power Rifle game, the rifle allowed is defined as being identical to the High Power Rifle. Rifles may be chambered only for the unmodified .22 caliber rimfire short, long, or long rifle. No special hot loads, such as “stingers” may be used. Except for the caliber restriction, all other equipment requirements are the same. High Power and Smallbore Rifle silhouette both have a Hunter Rifle class where only hunting style rifles may be used. These rifles are lighter in weight and very few modifications are allowed. Almost any pre-1896 American manufactured single shot hunting or military style rifle with an exposed hammer can be used. The course of fire is the same as High Power Rifle except that only iron sights can be used and the pigs, turkeys and rams can be shot using cross-sticks. The most popular caliber used is .45 70. Pistols allowed for Long Range Pistol silhouette are defined in the NRA rules and follow very closely the rules established by the International Handgun Metallic Silhouette Association (IHMSA). NRA Long Range Pistol silhouette has two basic pistol definitions and forms of competition: 1.) Conventional, which permits minor modifications, and 2.) Unlimited, which allows almost anything that can be done to a pistol within the limits of a 15 inch barrel and an 8 pound weight limit. Also associated with Long Range Pistol is a .22 caliber version called Smallbore Pistol that closely follows the Long Range Pistol courses. NRA Hunter’s Pistol competition is one of the most popular of the NRA silhouette games. Since it is intended as a sport for distances up to 100 meters, only certain calibers are specified as allowable in the rules. The definition is very similar to that of Conventional Long Range Pistol, except that the barrel length is limited to 12 inches and the weight to 5 pounds. Scopes are allowed as well as open sights. NRA Smallbore Hunter’s Pistol is fired with .22 caliber short, long or long rifle cartridges at the same distance and the same size targets as in Hunter’s Pistol. 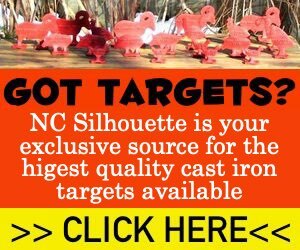 The targets are thinner material to permit reliable knockdown by the .22. Any air rifle weighing no more than 16 lbs. may be used in the Open Air Rifle class. Any unaltered factory target air rifle may be used in the Target Air Rifle class. The Sporter Air Rifle class includes any unaltered factory air rifle weighing less than 11 lbs., complete. Any caliber may be used in Air Pistol and Air Rifle Silhouette competition up to .22 caliber, and may be fired indoors as well as outdoors.